Urban Lux – the dumbest Yelp reviews ever? If you’ve frittered away some time scanning Yelp to check out a rental service, you’re familiar with the phonies, which are often funnies. The story: a “rock star” agent quickly becomes a renter’s soulmate, delivers awesome service above and beyond, and rapidly matches said renter and her boyfriend with the perfect place. Her delight in the experience impels her to create a Yelp account, share her joy with the world, and never Yelp again. You’d be wrong to conclude that there’s nothing to be learned from these reviews. I view them as a highly reliable index of the integrity of the company they’re written about. A pattern of clearly fictitious reviews tells you that you’re dealing with a company that tolerates dishonesty, and may actively encourage it. It also tells you that you’re dealing with a company that has contempt for your intelligence, and not much intelligence of its own. Creating fake positive reviews is always a dumb move, but some attain a stunning level of stupidity. Click on the screen cap image, and marvel at the fact that Urban Lux expected anyone to believe that Margret T of Lawrenceville, GA, Winnie A of Denver, CO and Pety D of Lawrenceville, GA all expressed their gratitude to the company in 244 words that were word-for-word identical. Ditto for the glowing 322-word reviews written by Brown L of Lawrenceville, GA and Rodney P of Denver, CO. You’ll find these efforts among the filtered reviews of Urban Lux at Yelp. Dishonest positive reviews typically give the full name of the “rock star” agent, and they’re often written shortly after an agent begins employment, in a lame attempt to attract business. Six months or a year later, I see that person still employed at the same company, and still unlicensed. Thanks for providing a record. 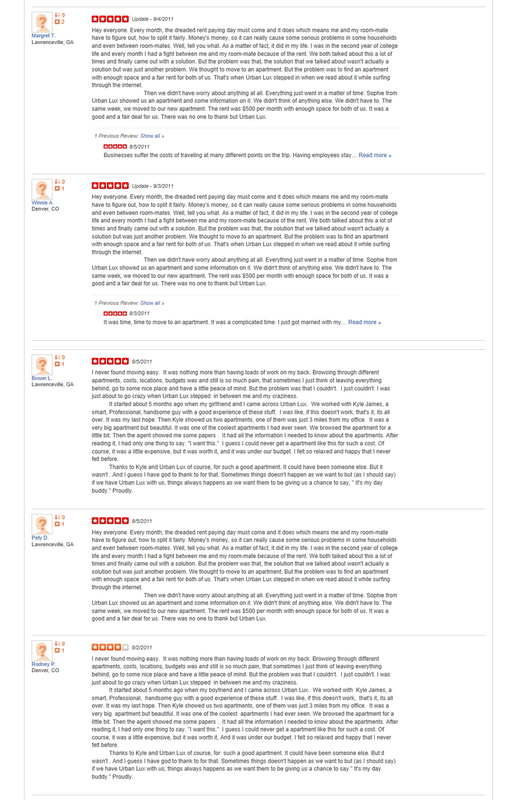 You’ll also find patently phony negative reviews of rental services at Yelp that reek of having been written by competitors. A smarter competitor could do more serious damage with positive reviews that are easily identifiable as false, but much more difficult to write off as having come from a competitor. If you’re looking to rent along Chicago’s lakefront from the South Loop to Lake View, you’ll find more options in YoChicago’s at-a-glance lists and maps and at the websites of major brokers than you’ll be offered by any of the rental services. Our lists deliberately don’t include some of Chicago’s worst landlords, who often rely heavily on rental services to promote their hard-to-rent product. That and the fact that they’re unlikely to show you MLS-listed condos are just a few of the things the rental services won’t tell you. NOTE: At the margins YoChicago competes with rental services for landlord marketing dollars, so we have an indirect financial stake in keeping the competition honest. Make whatever you will of that. I’m a sucker for yelp reviews. A couple of reviews, if accurate, were pretty egregious. And interestingly, they didn’t get “comments” from “Melissa” who seemed to have something to say about less serious issues on other comments. Ironic, you should see the recent reviews for Live Here Chicago. All posted by employees of Live Here Chicago. Andy R. is the listing agent, Kristin K is processing agent.